The study does not prove that fructose or its relative, high-fructose corn syrup, can cause obesity, but experts say it adds evidence they may play a role. Scientists have used imaging tests to show for the first time that fructose can trigger brain changes that may lead to overeating. This is your brain on sugar — for real. Scientists have used imaging tests to show for the first time that fructose, a sugar that saturates the American diet, can trigger brain changes that may lead to overeating. It's a small study and does not prove that fructose or its relative, high-fructose corn syrup, can cause obesity, but experts say it adds evidence they may play a role. These sugars often are added to processed foods and beverages, and consumption has risen dramatically since the 1970s along with obesity. A third of U.S. children and teens and more than two-thirds of adults are obese or overweight. All sugars are not equal — even though they contain the same amount of calories — because they are metabolized differently in the body. Table sugar is sucrose, which is half fructose, half glucose. 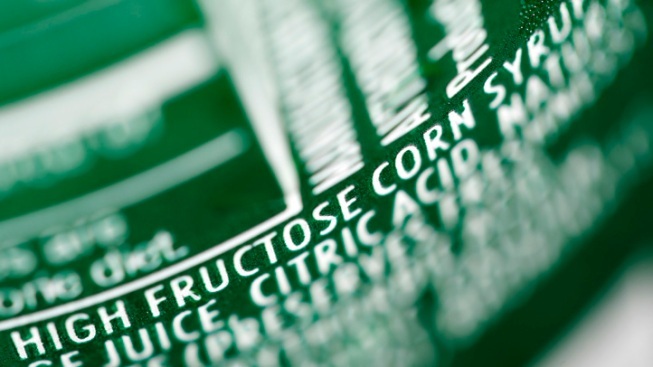 High-fructose corn syrup is 55 percent fructose and 45 percent glucose. Some nutrition experts say this sweetener may pose special risks, but others and the industry reject that claim. And doctors say we eat too much sugar in all forms. Scans showed that drinking glucose "turns off or suppresses the activity of areas of the brain that are critical for reward and desire for food," said one study leader, Yale University endocrinologist Dr. Robert Sherwin. With fructose, "we don't see those changes," he said. "As a result, the desire to eat continues — it isn't turned off." What's convincing, said Dr. Jonathan Purnell, an endocrinologist at Oregon Health & Science University, is that the imaging results mirrored how hungry the people said they felt, as well as what earlier studies found in animals. "It implies that fructose, at least with regards to promoting food intake and weight gain, is a bad actor compared to glucose," said Purnell. He wrote a commentary that appears with the federally funded study in Wednesday's Journal of the American Medical Association. What to do? Cook more at home and limit processed foods containing fructose and high-fructose corn syrup, Purnell suggested. "Try to avoid the sugar-sweetened beverages. It doesn't mean you can't ever have them," but control their size and how often they are consumed, he said. A second study in the journal suggests that only severe obesity carries a high death risk — and that a few extra pounds might even provide a survival advantage. However, independent experts say the methods are too flawed to make those claims. The study comes from a federal researcher who drew controversy in 2005 with a report that found thin and normal-weight people had a slightly higher risk of death than those who were overweight. Many experts criticized that work, saying the researcher — Katherine Flegal of the Centers for Disease Control and Prevention — painted a misleading picture by including smokers and people with health problems ranging from cancer to heart disease. Those people tend to weigh less and therefore make pudgy people look healthy by comparison. Flegal's new analysis bolsters her original one, by assessing nearly 100 other studies covering almost 2.9 million people around the world. She again concludes that very obese people had the highest risk of death but that overweight people had a 6 percent lower mortality rate than thinner people. She also concludes that mildly obese people had a death risk similar to that of normal-weight people. Critics again have focused on her methods. This time, she included people too thin to fit what some consider to be normal weight, which could have taken in people emaciated by cancer or other diseases, as well as smokers with elevated risks of heart disease and cancer. "Some portion of those thin people are actually sick, and sick people tend to die sooner," said Donald Berry, a biostatistician at the University of Texas MD Anderson Cancer Center in Houston. The problems created by the study's inclusion of smokers and people with pre-existing illness "cannot be ignored," said Susan Gapstur, vice president of epidemiology for the American Cancer Society. A third critic, Dr. Walter Willett of the Harvard School of Public Health, was blunter: "This is an even greater pile of rubbish" than the 2005 study, he said. Willett and others have done research since the 2005 study that found higher death risks from being overweight or obese. Flegal defended her work. She noted that she used standard categories for weight classes. She said statistical adjustments were made for smokers, who were included to give a more real-world sample. She also said study participants were not in hospitals or hospices, making it unlikely that large numbers of sick people skewed the results. "We still have to learn about obesity, including how best to measure it," Flegal's boss, CDC Director Dr. Thomas Frieden, said in a written statement. "However, it's clear that being obese is not healthy - it increases the risk of diabetes, heart disease, cancer, and many other health problems. Small, sustainable increases in physical activity and improvements in nutrition can lead to significant health improvements."